Does anyone know what this week is?! No guesses? It’s my birthday week! And last week was the one year birthday of Imperfectly Delicious. Hooray! I’ll spare you the song, but just know I’m humming it as I type. To celebrate I decided to bake a cake. I wanted something simple, but full of flavor to match the philosophy of this blog. Easy and fun! I found this fantastic recipe and, as usual, put my own stamp on it. Preheat the oven to 350 degrees F. Butter a 6-cup loaf pan and line it with parchment or waxed paper. In a medium bowl, whisk the flour, baking powder, and salt. This helps to break up any lumps and ensure your ingredients are well incorporated. 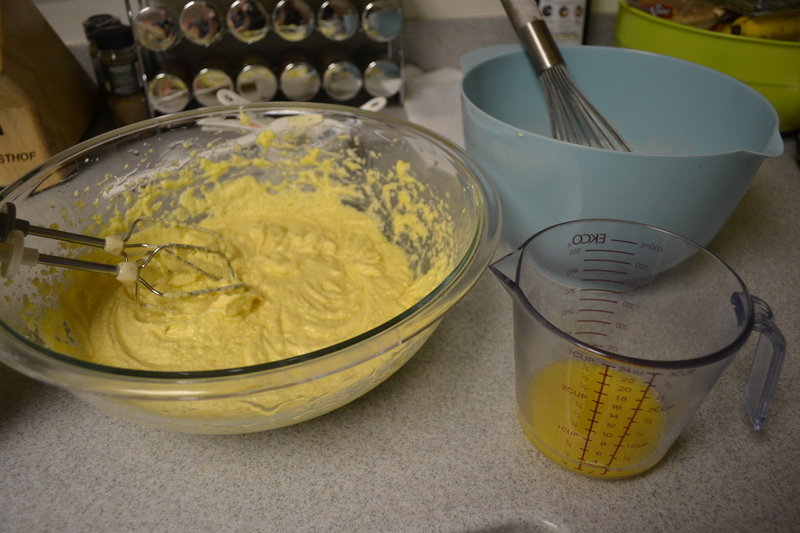 Using a mixer or hand mixer, cream the butter. Afterwards add 1 cup of the sugar and blend. With the mixer running at low-speed, add the eggs one at a time. The batter will be a very pale shade and be fluffy and light in texture. Add in the vanilla and mix. Gradually mix in small batches of the dry ingredients and the orange juice to the creamy butter mixture. Mix over the lowest speed until just smooth. Pour batter into the prepared pan and bake until golden and a tester inserted into the center comes out dry. I baked mine for 50 minutes at 350 degrees and 15 more at 325 because the top of my loaf was dark in color. In the last few minutes of baking start to assemble your glaze. 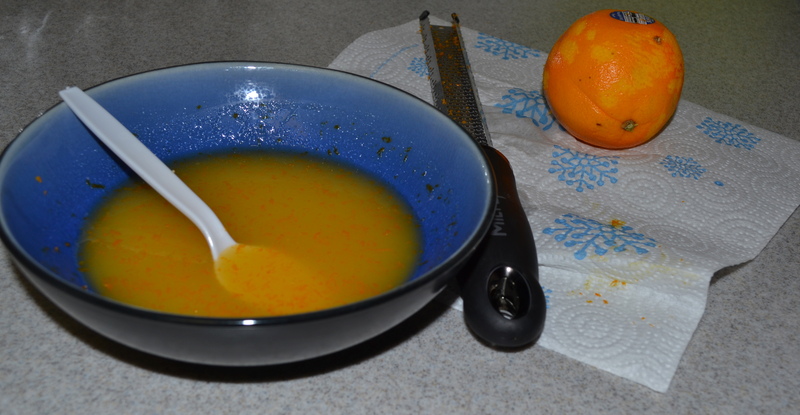 Combine the remaining 1/3 cup sugar, orange zest and the remaining 1/3 cup orange juice until the sugar is dissolved. When the cake is done, let cool in the pan 15 minutes (it will still be warm). Run a knife around the sides of the pan. Put a wire rack or silpat over a sheet pan with sides (to catch the glaze), and turn the cake out onto the rack. Peel off the waxed paper. It’s ok if a bit of the cake comes off on the paper, this will help the glaze soak into the cake. Using a pastry brush or a spoon, spread glaze all over the top and sides of the cake and let soak in. Make sure to use all of the glaze, including any glaze that dripped onto the sheet pan. I put plastic wrap under mine to catch the spills (oops). 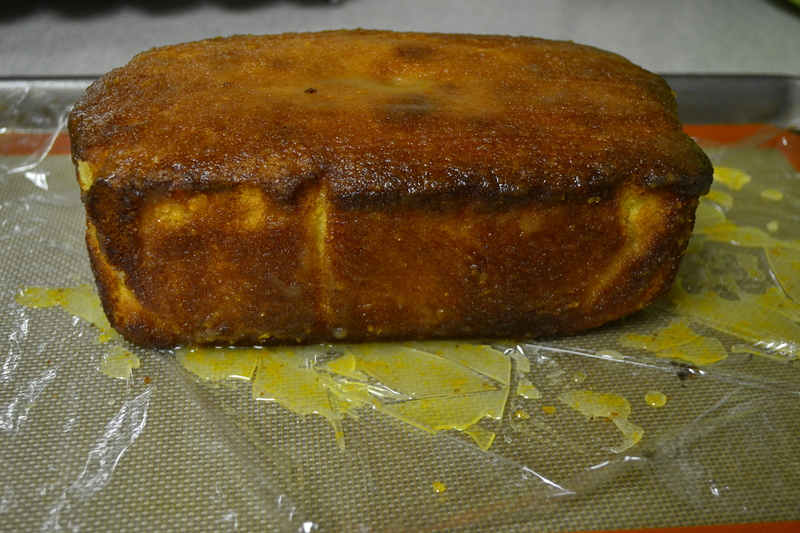 Let cake cool at room temperature, or wrapped in plastic wrap, in the refrigerator. Serve at room temperature, in thin slices. This cake is downright tasty! It didn’t actually end up tasting much like orange, but in a pleasant turn of events, much more like a glazed doughnut. The recipe just calls for sugar in the glaze, in the future I would use confectioner’s sugar/powdered sugar in place of the granulated. This type of sugar made the cake a bit sticky. Oh well, as we know no recipe is perfect every time. Don’t let that intimidate you! Keep working in the kitchen and let me know next time you make delicious treats! I know I was supposed to pepper you this past week with a gazillion posts on all things turkey, instead I write you about birthday cake. No it’s not MY birthday! I accept my gifts in mid January. It was my co-worker’s birthday this weekend, so I brought her a celebratory cake on Friday. To be honest, the cake itself wasn’t that memorable. She requested vanilla, so I complied. 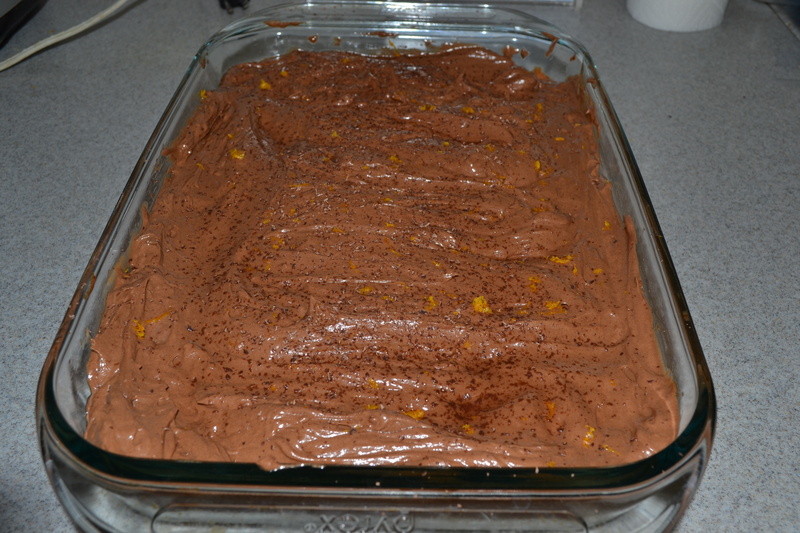 What WAS memorable was my new recipe for the most lusciously whipped Chocolate and Orange Frosting. Wow, I mean, wow. I’m so pleased with the way this turned out, I’m thinking of making another cake just to serve as an excuse to make more of this. As with most of my recipes, it’s really easy and doesn’t take too many ingredients. First melt your chocolate and butter in a medium-sized pot over low heat. Stir until melted and shiny. While you are waiting for the chocolate to melt, whip your cream and powdered sugar in a bowl with a mixer. It should only take a few minutes to whip up, and form a smooth, creamy texture. Pour your chocolate and orange juice into the bowl with whipped cream, and slowly fold the chocolate mixture into the cream. Folding the two mixtures will keep the frosting light and fluffy. Once combined, spread over a cooled cake, cupcakes or pour into a cereal bowl and pick up a spoon. 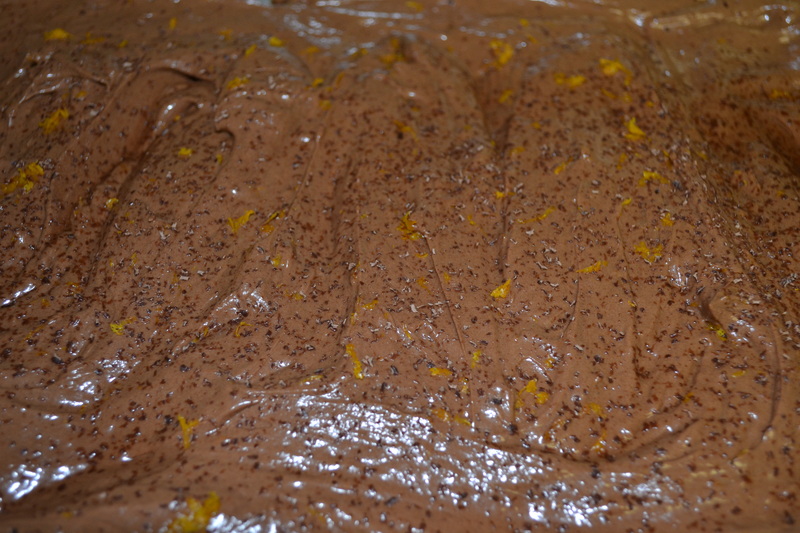 Spread orange zest and orange-flavored chocolate shavings over top. Wishing it was your birthday? 😉 I’ll be back tomorrow with more holiday-themed and Thanksgivingy items.